The VW Rabbit/Golf Diesel (CC here) self-ignited the small-car diesel soiree, back in the fall of 1976. During the historic run-up in fuel prices in 1980-1981, Diesel Rabbits were fetching 50-100% premiums in LA. Everyone rushed to get into the game, including GM, in a big way. The Great American Diesel Boom was underway. But Toyota was a bit late out of the gate, and by the time their 1C 1839cc four arrived here in the Corolla in 1984, fuel prices were sinking, and the Olds diesel fiasco helped close the chapter rather abruptly. After just two years in the US, the Corolla Diesel was history. The 1C engine was Toyota’s first modern diesel engine, appearing first on a JDM-only Starlet in 1979. It was also available in the US on the gen1 Camry (CC here), including a turbo-charged version. I can’t remember ever noticing one, but I take it for the truth. 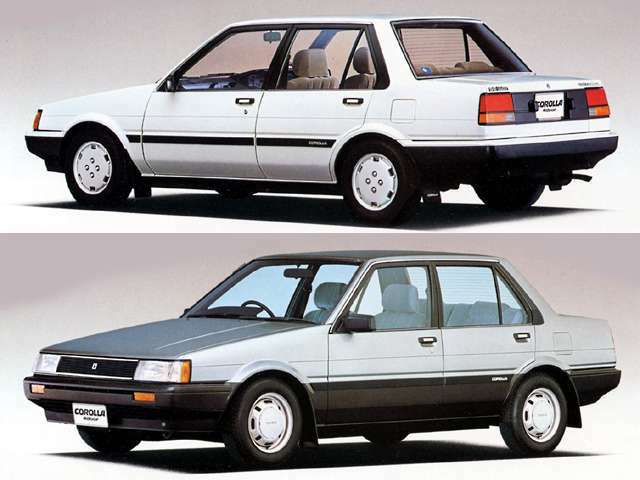 The version in the Corolla made 58 hp, which was better than the Diesel Rabbit by a good measure. It had excellent EPA numbers (adjusted): 33-43-37, a 28% improvement over the gas engine. But as gas prices sunk, that just didn’t ignite any interest. Who knows how many were ever sold in the US. 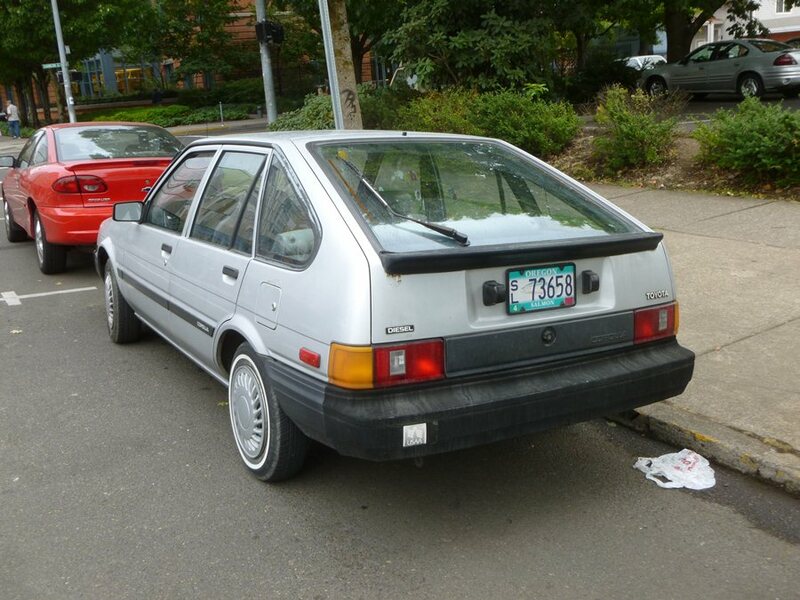 This generation Corolla was a very important one, in making the giant leap to a modern FWD configuration. Unlike most American cars that almost inevitably suffered initially from making the same transition, the all-new E80 Corolla never wavered one iota from its bullet-proof rep, despite truly being an all-new car. Take that, Detroit! If anything, the E80 Corollas even improved upon its already well-developed rep as being the low-cost way to go for driving a small sedan over the longer haul, especially at the higher commute mileages that were common in CA, thanks to its reliability and excellent resale value which typically more than offset its higher upfront purchase cost. There was a reason the Corolla developed its rep, and these are the cars that cemented it. This particular car is not only unusual for having the diesel, but also because of its hatchback body style. The notchback sedan (above) was much more to Americans’ taste in the mid eighties. 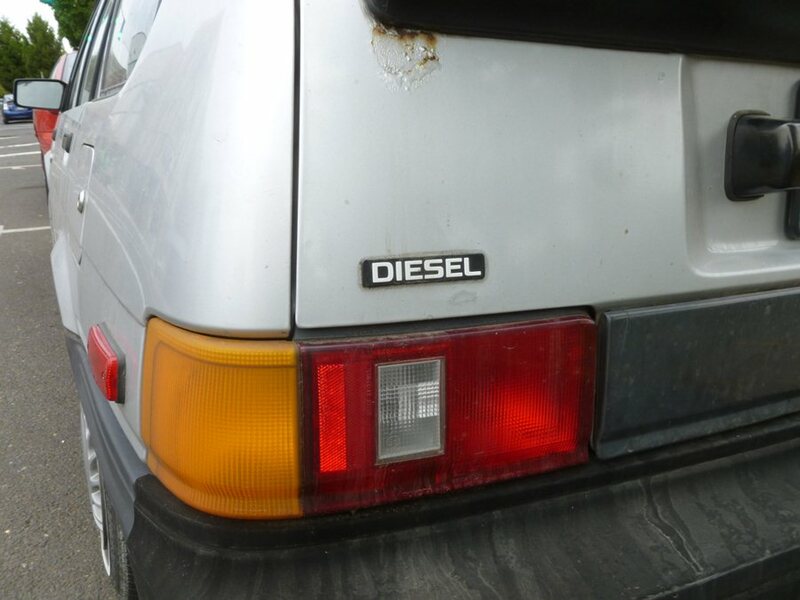 The hatchback era and the diesel era ended about the same time. But the hatchback was the preferred body in the rest of the world, so I’m sure it will look familiar to you non-Yanks. For us, this is a rather unusual outsider, in more ways than one. Dang, it’s hard to peel off a shot without another CC getting in the way. Used to see these often where I live. Wasn’t a fan of the styling but then again, never been a fan of Toyota here. Glad to see that they’re still running though. The CC effect strikes again. Just saw one of these on the way to work today (probably not a diesel though), but it was a hatchback. It has been a while since your post. I assume you sold your toyota diesel, I have one to sell which is in good shape, new paint,, good interior, motor sound. I find no others for sale on any websites and am wondering what it is worth. any ideas you can help me with. If your’s sold, can you tell me what it sold for. Hello, I also have one of these gems. I’m having trouble finding the value! Any ideas? It needs some love, but runs great. It has 180k miles on it. Thanks for any insight! For a few months in 2006, I sold Lexus cars in Pennsylvania. There was a longtime salesman there who had sold Toyotas back in the 1980s. He had a diesel Camry as his loaner for quite some time. The owner of the dealership used to assign out cars they were having trouble selling as loaners; the idea was that if the salesmen (and they were all men then) didn’t care for the car, they’d be more motivated to sell it so they could get a more palatable loaner. The plan backfired on this particular salesman when it came to the diesel Camry. Everyone else hated them but he loved his. You could tell the history of what sold poorly by looking at what demos the salesmen got at that dealership. Wow, diesel and hatchback! I haven’t ever seen a diesel Toyota in person. I would consider a diesel Camry today if they were offered with a manual trans. The dog is in the way there- was this one a manual trans? Hopefully so. Did you get any info on the value of your carolla? I’m also thinking of selling mine. Thanks! I didn’t realize they sold a diesel Corolla here. I’ve always though the hatch version of these is rather odd looking especially from the rear but undoubtedly more practical than the sedan. Double unusual, that hatchback body style was mostly sold as a Chevy Nova in the US. Also that is the first time I have seen a US market Toyota diesel car, the only 80s Toyota diesel car I ever saw was a South American market Carina some diplomat brought up in 86. The Nova had a different hatchback design. 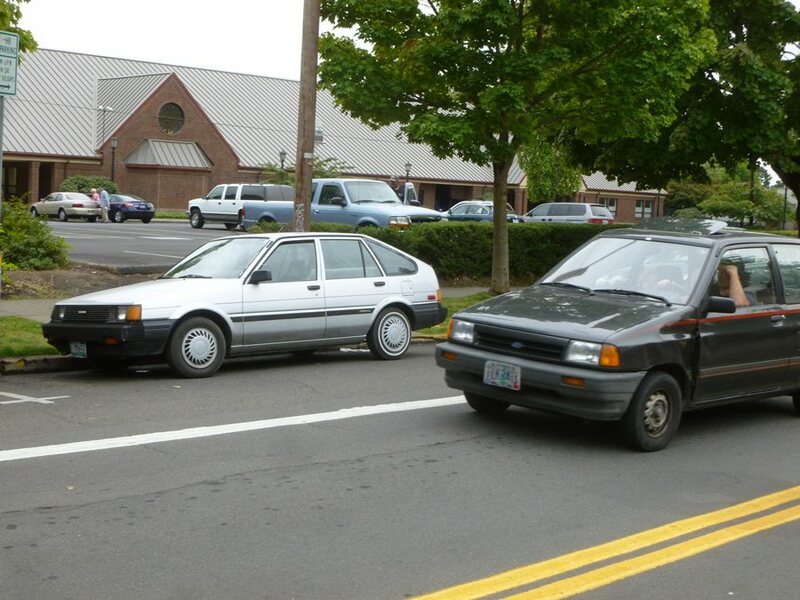 I beg to differ, this shot of an 86 Nova from Wikipedia shows an identical body except for the front clip. My bad; I mixed it up with something else. Sorry. Right you are; oddly, the Nova version of the sedan had its own sheetmetal while the hatch Nova was identical to the Corolla hatch except for the grill. 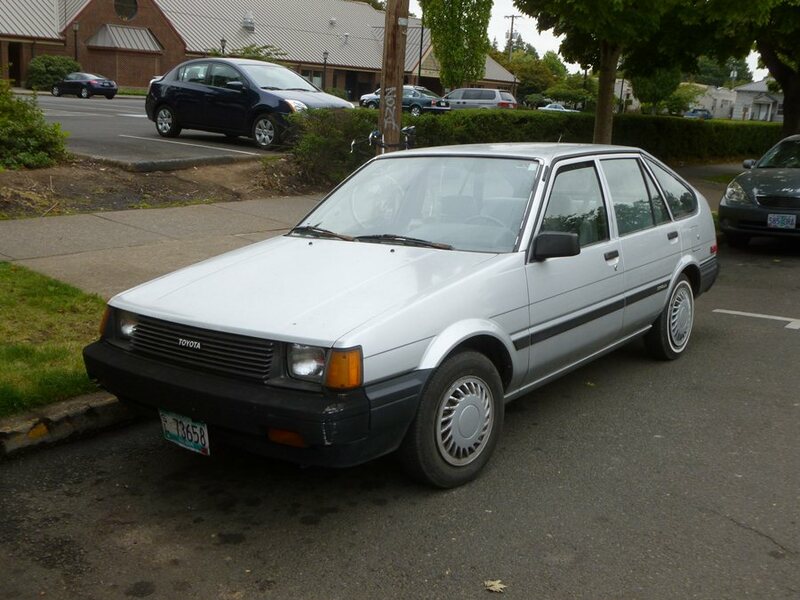 I bought an ’86 Nova sedan, a corolla under the metal all the way, built by the joint Toyota/Chevy plant in Fremont California, now being used (part of it anyway) to build Tesla electric cars. The Nova gas version was just as indestructible as the Corolla and got 40mpg hwy even with 165k miles on it. Never knew there was a diesel Corolla. 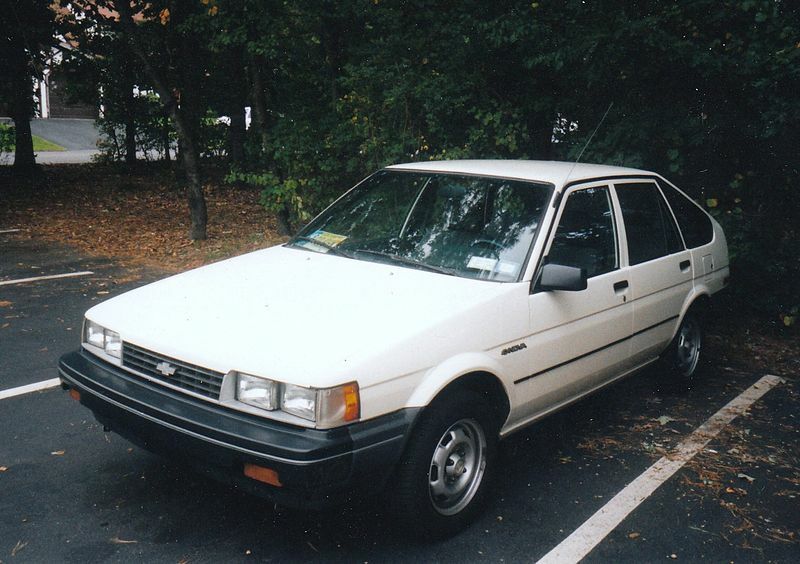 The Nova sedan used the sheet metal that was used for a Toyota Sprinter (JDM) version. The hatch mixed up parts of both. Convenient; and no needed extra expense for tooling. I never knew these existed, possibly they weren’t sold in Canada. The Chevy S-10 pickup was available with an Isuzu 4-cyl diesel but not sold in Canada. I just read about the 2.4L turbodiesel Fox Conti on Wiki. They said in effect that it flopped, along with gas prices at the time. Too bad. What’s the best theory about why Diesel is so much more expensive here than in Europe? Is it taxes, EPA rules, demand > supply, or what? The United States federal excise tax on gasoline is 18.4 cents per gallon and 24.4 cents per gallon for diesel fuel. On average, as of January 2013, state and local taxes add 30.4 cents to gasoline and 30.0 cents to diesel, for a total US average fuel tax of 48.8 cents per gallon for gas and 54.4 cents per gallon for diesel. Thanks; I wasn’t sure since the price spread is often greater than the tax difference. The higher levy on Diesel seemed politically unlikely, but I just learned that Farm Diesel is exempt from the tax & has more sulpur (despite being exhausted into the same airspace). It is dyed red to flag those who use it on public roads. I suppose any attempt to require farms to use the same Diesel as everyone else would cause the farm lobby (think corporate agribiz, not Ma & Pa Kettle) to go ballistic. Unequal Justice for All. Why do think American farmers drive diesels whenever possible? 🙂 Who would check their tank? The Federal Bureau of Diesel Tax Compliance? Actually, this has gone on almost forever; with gasoline back when tractors ran on that. I never saw Mr. Yoder fill up the family Bel Air with anything other than from their farm big tank. This was a big issue in Germany and Austria, where taxes are of course many times higher. Farmers were the first to embrace MBZ and VW diesels after the taxi operators. But in typical German fashion, they did create a Federal Bureau of Diesel Tax Compliance, or some such thing. Stiff fines, too. But it still happens. My BIL has told me that there is much more risk of getting caught than in the old days. He maintains one tank for road vehicles, the other (non-taxed) tank for equipment. To qualify for tax-free fuel, you have to get a license through the State Dept of Revenue, and you have to maintain records of fuel use and miles driven. I believe that the DOR will do periodic random inspections. If you get caught with farm fuel in your truck, you will lose your license, and you must use fully-taxed fuel in everything, which would cost a farmer a LOT of money. JPC: I should have know better than to assume that. The bureaucrats’ noose gets snugger with the passing of time. Its not just the farm lobby. FedEx, UPS and other major freight operators get a refund of the fuel burned in non street legal Hosteling (Switching) Tractors. IIRC the Cement industry association got a special exemption X percentage of their diesel tax is refunded as its used to power the mixer, not as a motor fuel. At the major truck scales in California BOE (State IRS) auditors will occasionally check fuel tanks of trucks passing through. The fines are quite steep if you are found to be running dyed fuel. I had no idea that these ever came as a diesel. I knew about the Camry, and even rode in one. The car had some sort of catastrophic engine problem during warranty, and Toyota bought the car back instead of trying to fix it, IIRC. But these – another one that if I did know anything about it, I had long since forgotten it. Count me as another that never liked the look of the hatch. In profile, it always reminded me of a garbage truck. The problem with the styling is simple. Studies have shown that the same part of the brain is used to identify cars that we use to identify faces. We often think of the front of a car as a face, but you can look at the rear the same way, with the lights as eyes and the license plate as a nose or mouth. Now, how do you think a face with the nose above the eyes would look? Exactly. This is an example of pareidolia: The tendency to interpret a vague stimulus as something known to the viewer. This is the single oddest comment I have ever read on CC. Congrats! Toyota 1c and 2c diesels are nearly indestructable that engine is used throughout the Toyota small vehicle range 2ct being the turbo version. Slack coolingsystem maintenance is the main cause of death in these with cracked heads being the result. The injection system was licensed from Bosch and is nearly identical to the injector pump on my Citroen and from experience are very simple to fit new seals into to fix leaks caused by the low sulphur diesel available today. I’ve got a 2ct in my 20 year old TownAce. We’re going to try to keep it for another couple of years, but I’m resigned to eventual cooling-system failure and cracked head. An old 2 litre diesel in a van is not the fastest means of transport, but it gets you there. Lugged a whole bunch of camping gear through the twisty Coromandel hills at the weekend, and kept up well with the traffic. Get the radiator cleaned out that is the death of most NZ vehicles blocked radiators, If it cracks Irontight the engine to keep it running and sell it fast. And run distilled water! I swear that’s one of the biggest causes too, so many people use tap water, and it can be bad news. The cost of a 10 litre (or possibly 2 in the case of a van) bottle of distilled water vs the cost of head job is minimal. Thanks Bryce, that’s great advice. It’s got a WOF coming up, so I’ll get him to flush it at the same time. CC Effect: Saw the Chevy Nova variant of this yesterday in blue (not diesel, though). If you had seen a diesel Nova, it would have been like seeing a unicorn. I know. I haven’t seen one (yet). Had a Corolla of this body shape, with a 1.6L petrol engine. Chugged along happily and then one day the head gasket went pop without warning. The car was pretty much worthless at that point, so I drove it around town for another month or so, regularly topping up the water. Eventually the oil was almost completely white with emulsification. I then gave it to a friend who replaced the gasket and it ran very happily for several more years. The car had one very exciting fault – on an intermittent basis, as you flicked the lights to High Beam, all lights would cut out completely. Quite disconcerting the first time it happened, doing 100kmh on a pitch-black country road. The friend I gave the car to had a lot more trouble finding and fixing it – an intermittently broken connection deep behind the dashboard. 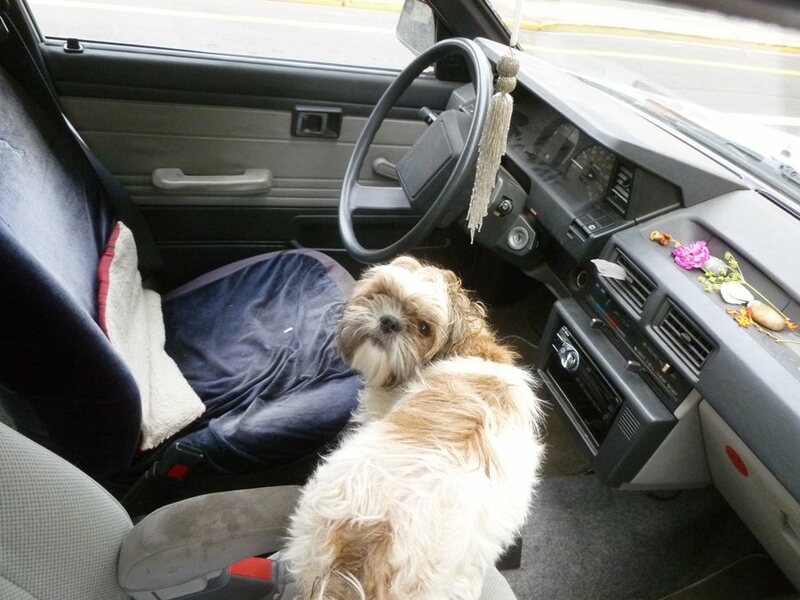 I knew the Oregon was Endor, there is an Ewok stealing that Corolla! Automotive unicorn! And with a puppy too! I think I have seen a diesel sedan or two in Canada but not for a long time. Whenever someone starts longing for more diesel cars…I think back to my (mercifully brief) attempt to go back to long-haul trucking, two years ago. One thing that’s now almost universal, unheard of in 1989…was DIESEL EXHAUST ADDITIVE. Which is UREA. That’s right…a urea solution is added to the exhaust. I guess because to some bureaucrat, steaming peewater is less offensive than Caterpillar diesel smoke. Which is also gone, FWIW. Caterpillar, which had the more powerful and more desired road-tractor diesel engines, is now out of the on-road business. Again, thanks to the EPA. But, to the point: Can you imagine Grandma Jones keeping her car’s DEA urea tank topped up? At the ungodly price for that stuff that truck stops wanted? Cat out of the on-road business?!? What did you smoke tonight 🙂 Urea? 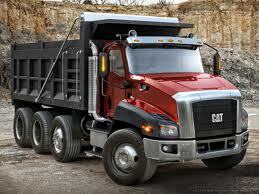 Cat is actually launching their own brand of trucks! And this is coming from an ex-truck driver? Yes, SCR (selective catalyst reduction) is another one of those Commie/bureaucratic plots, like all the other ones we’ve had to endure in the process of cleaning up our air and lungs. Damn; I miss the the black soot I used blow out of my nose in the good old days. Last I read, the EPA sued Caterpillar to within an inch of their survival, for what the EPA claimed were “fraudulent” emissions tests and documentation on a couple of their popular road tractors. Now I was never C.W. McCall…but about 1989-90 I drove tractor-trailer a bit, and then had a city job 1995 in Denver. Then, again, two springs back, when I was between railroad gigs. The company I worked for in 1990, had International cabovers, half with Cummins engines and half with Cats. Same displacement…you could hear the difference at a hundred yards, and driving them was as different as night and day. The Cummins was quiet, inoffensive, and I think a little more economical. The Cat sounded like a Selectric with strep throat, but it would stand up and dance when you mashed the pedal. Fast forward to two years ago. Cabovers are gone and so are the Cats. DEA is in and Cummins and Detroit Diesel are the choices now, it seems. It’s really not my world; and I never followed it carefully, but I came across that in looking for why I didn’t see any but old Cat-powered tractors. Footnote: Found this on a quick search. “Caterpillar will not produce an engine for North American on-highway truck makers that will meet stricter 2010 emissions standards, said George Taylor, company director for global on-highway products. Caterpillar also announced June 12, with Navistar, that the companies will produce a Caterpillar-branded severe-service vocational truck. Those moves are the leading edge of a strategic partnership between the companies on global initiatives in diesel engine technology, Taylor and others said in a media conference call. Thanks for the explanation. I just went to the CAT website and found some more info too. I’m not surprised, as most of the truck companies are moving to greater vertical integration; the pressure on the independent engine makers is getting greater, especially since new technologies are getting more expensive. But SCR is clearly the way to go, until someone comes up with something better. Caterpillar went all-in with their ACERT technology (see link below) and it wasn’t able to meet the newest emission requirements – and by the time that they figured this out, it was too late in the game. This is the real reason that they suddenly exited the on-road engine market (and ticking off a whole lot of people – their engine was considered the cadillac of heavy-truck engines by a lot of truckers). International went one step further into deep doo-doo, proceeding to build and sell diesel engines (not using SCR) that didn’t meet the new emissions standards and are now in trouble with the EPA. Urea additive just seems to work. At my work We now have 3 Frontloaders and 2 F550 Fords that take Urea and AFAIK they have had zero emissions related downtime. This is in stark contrast the 2007-2010 equipment that just uses a big honkin’ DPF and lots of EGR has been very problematic. Our two 6.4 Powerstroke Ford F550s have been fuel sucking hangar queens, one recently ate both turbos to the tune of $8k. The loaders will overheat easily when pulling hills and would plug their DPFs in 3-5 hours of hard use on a commercial dumpster route. The last good CAT Motor was the 3406E. The ACERT motors after that were fragile, thirsty dogs relative to the competition. Most everything at a truck stop has ungodly markup. They have to recoup the cost of all that free parking somehow. Interesting find, that Toyota Corolla. In looking at it from the side profile, I’m suddenly reminded of the VW Dasher….. I always liked the shape of these Corolla hatchbacks. I remember seeing my first one in 1985 as an 11 year old riding my bike on to school. I thought it was really nice looking – something that holds true today. 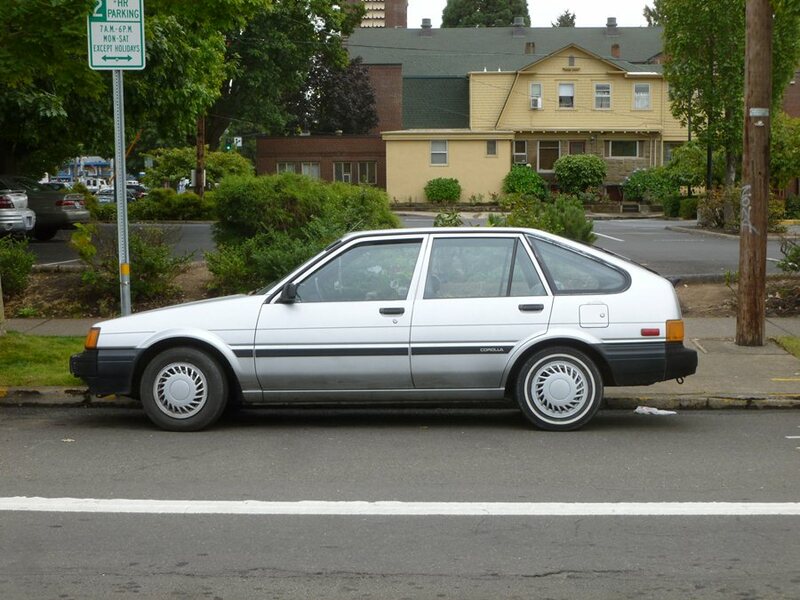 My best friend’s first car, about ten years ago, was a 1986 Corolla hatch. It was a petrol 5-speed, and had been a Toyota-NZ demo car in its past so had factory bodykit and a/c. It was a fantastic first car. Never seen a diesel one though – the only diesel Corollas I’ve seen here are station wagons. Theres one in the panel shop at Eastern institute of Technology Taradale campus a diesel very rare in hatch here. I own one of these and happened to noticed the background, Eugene! My hometown, it was the library that gave it away. And I love my car. Go diesel! My boyfriend owns the car in the picture. He didn’t own it at the time this picture was taken though. It only has 131K miles on it and it runs like a champ! I love driving it, and do quite often! It gets about 40 mpg too! Almost everytime I’m out and about in it I get stopped and end up talking to amazed people that Toyota made a diesel car. Have even had a few offers of people wanting to buy it! I need to buy a Toyota corolla 2.manual diesel engine with good mileage.Help.